After spending yesterday evening and part of today with my yoga friend Nick, I was reminded of what a blessing our yoga friendships are. As a yoga teacher or student, you may have had the experience of meeting extraordinary people through the vehicle of yoga. Many of my best friends are people I’ve met through yoga. Judy and Michael, from our little community on Mitchells Island, were yoga friends first twenty-five years before they became co-proprietors with us. Even though yoga teachers may try to maintain a professional distance from students, I think it’s difficult to do because of feeling such a spiritual connection with them. When we build into our yoga schools the concept of community, it is often predicated on being equals and working together in our own growth. I was afraid when I moved to the country that I might lose touch with my Sydney base which I had established over a 30-year period of teaching. 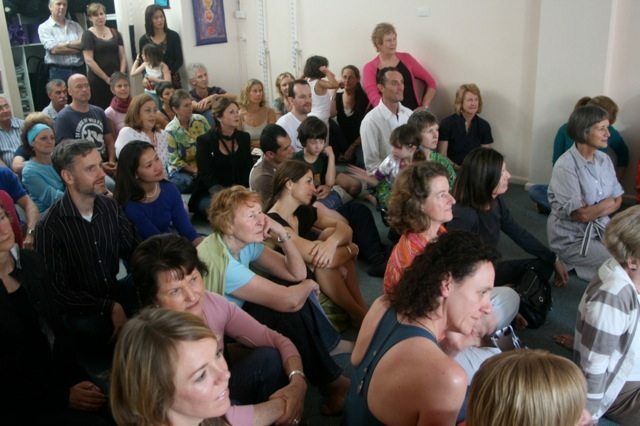 Instead, I’ve had the gratifying experience of being able to stay in touch with dear yoga friends, especially this last year, through their visits to Mitchells Island – as well as seeing some of them at the Falls Forest retreat I ran in October and the Yoga Australia conference of last April. There is closeness that is bound up with hoops of love that we share those within our yoga circle. It’s ineffable and at the same time palpable – in the category of priceless riches.